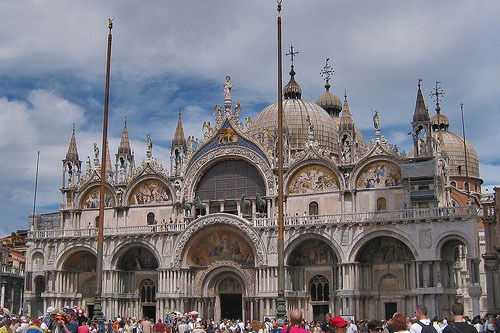 Piazza San Marco is often described as the most beautiful square in the world, with its views across the lagoon and the magnificent multi-domed basilica making a truly inspiring sight. The Piazza was built in the 11th century (although much reworked since) to house the body of St Mark, which was brought here from Alexandria in the eighth century. While the exterior of the basilica is a multi-arched, highly decorative, lacy fantasy, the interior is even more ornate. It is dripping with gold, glass, and marble and adorned with 4,000 square meters of mosaic, covering the walls, floors, and vaulted ceilings. The Byzantine altarpiece, the Pala d’Oro, is also studded with priceless gems and gold leaf. The four bronze horses on the terrace of the basilica are copies of originals now in the Museo Marciano, which Napoleon once installed on the Arc de Triomphe in Paris. They were returned after he lost at Waterloo in 1815. 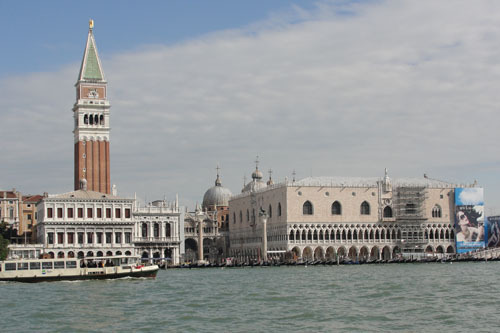 Right next to the basilica is the elegant and spiky Campanile (bell tower), Venice’s most familiar sight, and at 99 meters its tallest structure. It was finished in the 16th century but collapsed in 1901, only to be rebuilt brick by brick. 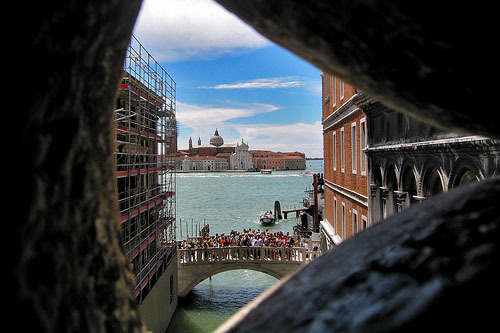 Take the elevator to the top for glimpses across Venetian rooftops. The Basilica is open Mon-Sat 9:45am - 5:00pm, Sundays and holidays 2:00-4:00pm (until 5:00pm Easter to Nov). Free admission. Check the website for Basilica closures. Dress modestly with shoulders covered and no shorts. Photos/filming are forbidden. There's a ten minute timed ticket for the Basilica. Opening hours for Museum, Pala d'oro and Treasury vary - see website for full details. In the glory days of the Venetian Republic, the Doge was the state’s supreme figure. Elected for life, his power was reflected in the grandeur of this palazzo, built as the administrative center of the governments of the 14th, 15th, and 16th centuries. Built in pink marble atop a double row of arched loggias of white stone, the palazzo’s Gothic façade looks out over the Basin of San Marco. From the flamboyant Porta della Carta, a passageway gives into the internal courtyard, where a giant staircase leads into the salons and meeting halls, many designed by master architect Palladio. Here you’ll see some major artworks by Veronese and Tintoretto– the latter’s Paradise dates from 1590 and dominates the opulent Sala del Maggior Consiglio, where the ruling council met to debate affairs of state. The armory holds a collection of medieval weaponry and the doge’s private apartments house a rare collection of 16th-century maps. Torture chambers were hidden away deep inside the building and right adjacent is the tiny Bridge of Sighs, connecting over a small side canal to the doge’s state prison. Spare a thought for the convicts who had their last sighting of Venice from this bridge as they were taken away to execution for political crimes. The Secret Itineraries Guided Tour (buy online to secure a space on the tour) is a great way to get a 90 minute look into areas of the Palace that are not otherwise open to the public. Highlights include Casanova's cell and the story of his escape. Buy tickets online to avoid long lines. Ticket office closes an hour before the palace. 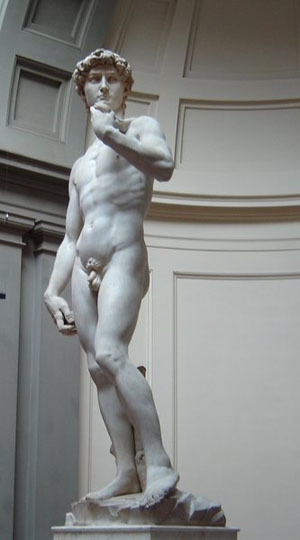 Price includes entry to Museo Correr and Museo Archeologico Nazionale. World-famous Venetian glass, in rainbow colors, has been produced since the 1290s on this microscopic series of islands in the Lagoon. Murano is a pleasant place to while away half a day exploring the medieval waterfront houses, back-street alleyways, and bridges over narrow canals; take the waterbus over from Fondamente Nuove. Make time for the colonnaded and curving apse of the lovely Basilica dei Santa Maria e Donato, architectural highlight of the islands, which dates from 1140. Most visitors, however, head to Murano for the glassware, so head for the Museo del Vetro, housed in the restrained 17th-century Palazzo Giustinian. Here you’ll get to learn about the history of glassmaking–by the 15th century, Murano was the center of the industry for the whole of Europe, specializing in highly decorative shapes and jewel-like shades. There’s a rare collection of glassware in all shapes and sizes dating from Egyptian times to contemporary pieces in vivid primary colors, but don’t miss the cristallino glass popular in the 15th century, as pale as Murano glass is normally bright, and delicately patterned with flower, fruit, and mythical motifs. 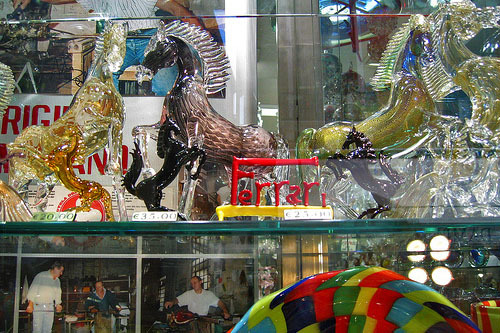 Afterwards, discover the many stores selling glass to choose a souvenir piece, but don’t expect many bargains. It will take approximately 4 hours to tour the island and 1.5hrs to see the museum. Hours of opening provided are for the Museo del Vetro. Last admission one hour before closing time. The museum is currently under restoration. Clamber aboard vaporetto no. 1 at Piazzale Roma (Venice’s main transport hub) for what must be the canal trip of a lifetime. Chug past all the glorious palazzi, bridges, baroque churches, and museums lining the Grand Canal, oft described as ‘the most beautiful street in the world’. It’s an inspiring experience and the best way to find your feet in Venice. The architectural mish-mash along the canal spans five centuries, from the Byzantine arches of Palazzo Segredo to the Gothic tracery of the Ca’ d’Oro and the patterned marble façade of (crooked) Palazzo Dario, dating from 1487. 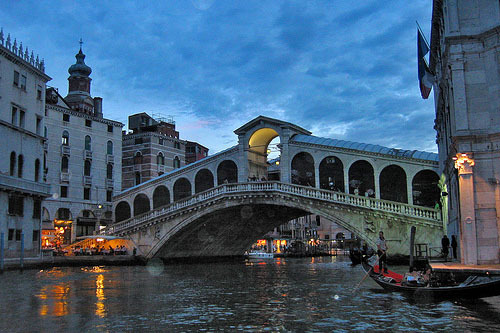 Other unmissable sights include the Rialto Bridge, the renowned Accademia, home of the finest collection of Venetian art in the world, and the world-famous Gritti Palace Hotel, with its fine Renaissance façade. Further down the canal the Baroque splendor of Santa Maria Salute is poised at the mouth of the Grand Canal. Built in thanks for Venice escaping the Black Death of 1630, the three marble domes and the basilica of the church are supported by more than a million timber piles. If you are of a romantic bent or have money to burn, hire a gondola (around 80 euros for 40 mins) and let the gondolier guide you along the sweeping curves of the canal. Prices vary. Buy ticket at landing stage. The duration varies according to route. 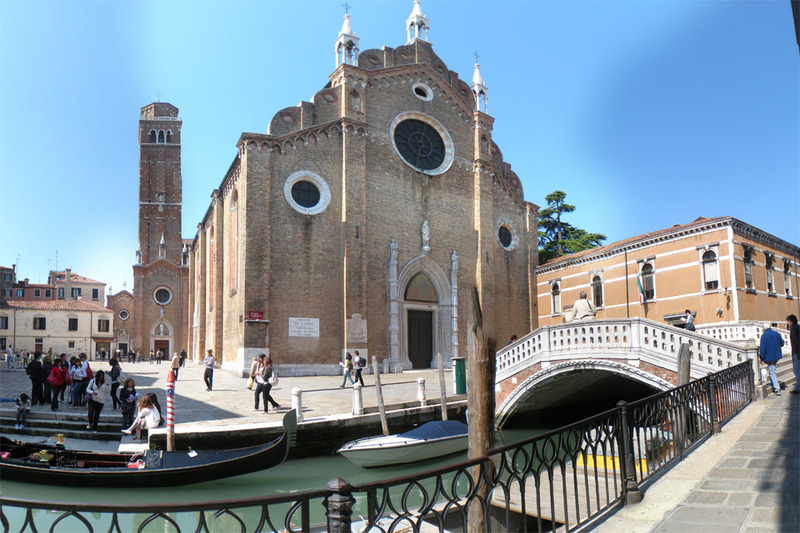 Known locally as 'I Frari', Venice’s second-largest church — it also has the second-tallest bell tower — was built in the 14th century in subdued Gothic style. As befitted the Franciscan monks who commissioned the church, it has a simple brick façade concealing an interior containing a superb collection of masterpieces by Renaissance artists Bellini, Donatello, and Titian, whose golden Assumption of the Virgin hangs over the high altar. He died of the plague in 1576 and is buried here in a monumental marble tomb halfway down the right aisle. The tomb of Neo-classical sculptor Antonio Canova is found in the left-hand aisle, completed by his pupils in 1827, five years after his death; the spectacular hand-carved choir stalls were crafted by Marco Cozzi in 1468 and are inlaid with mosaic views of Venice. By night the church is the wonderfully romantic venue for classical-music concerts. In the early 16th century, one of Venice’s aristocratic scuole (fraternities of lay preachers dedicated to good works) built themselves a grand meeting hall. Investigate behind the elaborate late-Renaissance façade to discover breathtaking Tintoretto-decorated walls and ceilings, rightly considered one of Venice’s artistic highlights. These were commissioned by the scuole members in 1564 and were some 23 years in the executing of Tintoretto’s moody, vivid, movement-filled paintings of religious scenes. To view the works as they were painted, start at the top of the building in the Sala dell’Albergo, and work your way back down to the majestic hall on the ground floor. Upstairs, the sombre ceiling paintings cover scenes from the Old Testament, including dramatic visions of Moses Saved from the Water and Jonah Emerging from the Whale, but the real star of this grand hall is The Temptation of Jesus, from the New Testament legends depicted on the walls, in which the devil is offering Christ loaves of bread in the desert. Just close to the altar you can spot a Tintoretto self-portrait, and there’s a splendidly gloomy Crucifixion. Downstairs the eight paintings illustrate the tale of the Virgin Mary from Annunciation to Assumption, including an eerily serene Flight into Egypt. Use the hand held mirrors available to check out the ceiling paintings. 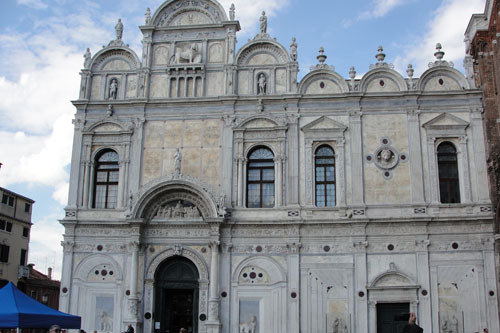 This art museum is a large complex housing the biggest collection of Venetian paintings from the 1300s to the 1700s. Bellini, Tintoretto, Tiepolo, Veronese, Canaletto, Longhi are only some of the famed artists of the Gothic to the Renaissance period that are well represented in this impressive collection. The Accademia was originally an Academy of Painters and Sculptors, started in 1750, and then substantially expanded in 1807, when Napoleon closed down religious institutions and moved their artwork into this collection. Tickets can be purchased online. Last entrance 45 minutes before closing. This information was accurate when it was published, but can change without notice. We are not responsible for any loss suffered in connection with use of the content or services available via the site. For Children en-route to Paris!